Find YOUR OWN method to get the most out of your organic materials collection. There is more than one way to manage your brown bin. Just like recycling, everyone develops their own strategies depending on the residue, their motivation, their practices, the space available, the household’s ability to manage the materials as well as their ability to adapt to new tasks. Just remember that plastic bags, even compostable ones, are not allowed in your bin. Here are some tricks and tips that will help you take control of the New Guy and make your life easier. You can wrap your materials in brown grocery bags, newspapers, flyers or cardboard. Often doubling or tripling the thickness prevents any leaking liquid. Make your own paper pouches by using flyers or newspapers. The folding technique is very simple. See the video by clicking right here. Wrap your leftovers in newspaper by using the wrapper technique See the video by clicking here to view an example of how it is done, in Gaspésie. The best trick for using the brown bin properly without any discomfort: Put any stinking residu (meat, fish, dairy products and other animal-based materials) in the freezer while waiting for the collection day. The refrigerator is another alternative if you don’t have enough space in your freezer for similar results. Peelings of fruits and vegetables, bread, coffee and other materials that does not produce any bad odors can be accumulated without any inconvenience in your mini bin under the kitchen sink. Of course, it is important to regularly empty it in the brown bin. The paper bags distributed at the same time as your brown bin will help you get started on how YOU will want to manage your waste materials. Once these all used, new ones can be purchased at your grocery or hardware stores. 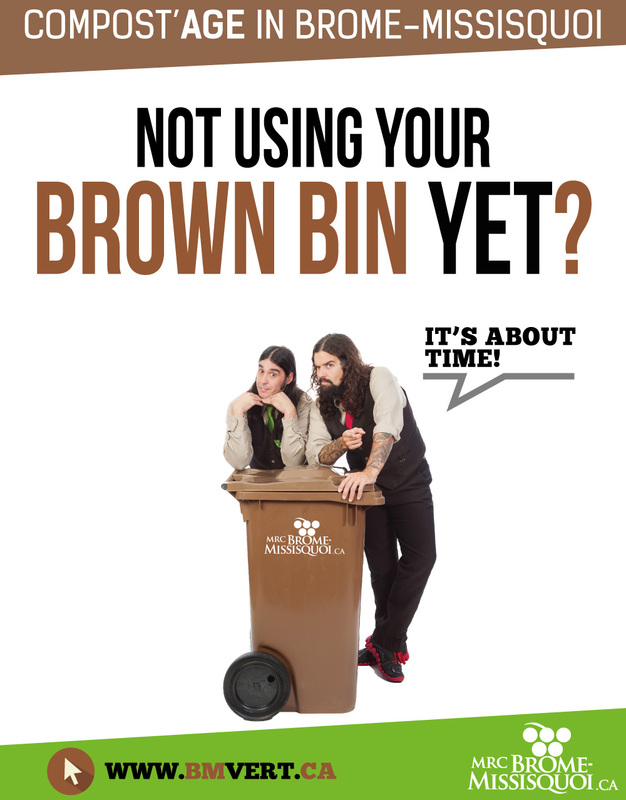 Because you cannot put meat, fish, fatty or sweet materials, paper and cardboard soiled with food, nor weeds that have seeded in your domestic composter, we encourage the population to use the brown bin as a complement. For a household that does their own domestic composting, the little bit you put in your brown bin makes a difference at the end. 1.5 kg to 2.5 kg of materials place in the bin represent 100 kg per year! So, for about ten household a ton of waste per year will be diverted from the landfill site and will be valorized a new! Not counting the winter months where the brown bin will be easier to access than the domestic composter that usually sits at the far end of the yard. It is not necessary to wrap materials before putting them in your brown bin. Everything can be discarded in bulk, directly from your kitchen mini-bin. In this case, however, it will be necessary to clean both bins more often. Even if you wrap your materials, it will be important to clean the kitchen mini-bin and your brown bin with soap and water in order to avoid any inconveniences.